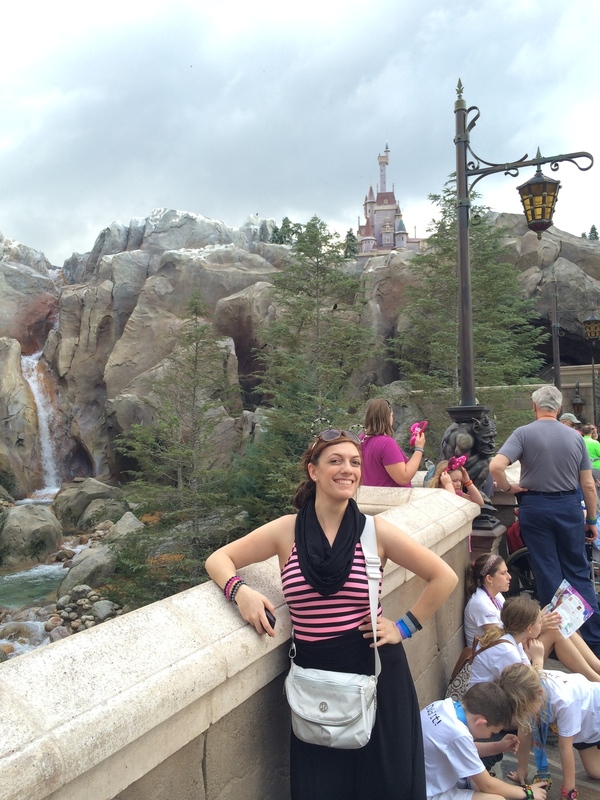 After the 10K (and a shower, and some eats), I headed off to the Magic Kingdom. 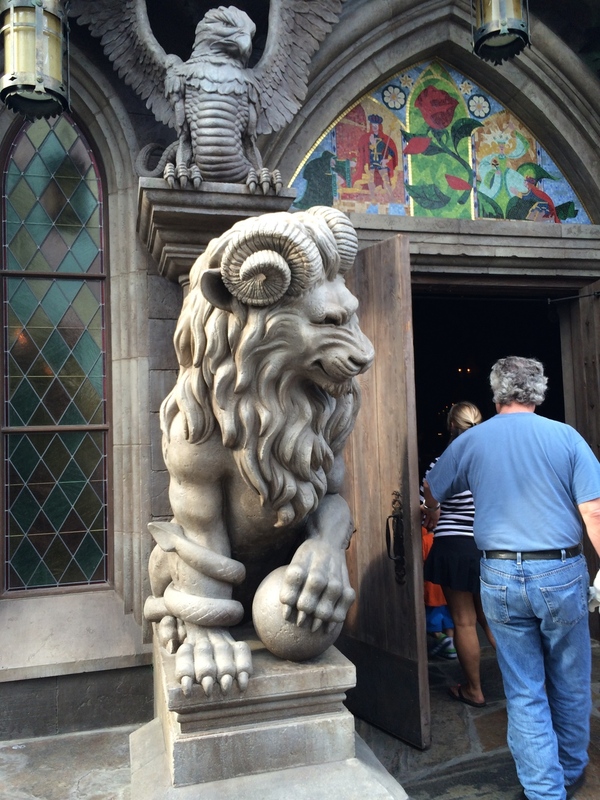 I actually hadn't really seen the new Fantasyland in depth yet, so I was excited for that. I planned on taking more (and better) pictures on upcoming trips, so I didn't use my Nikon camera (I actually didn't bring it). All these are through the iPhone lens. I love that the construction walls are finally down. Beautiful with all the towers and "stone," as well as this clear view of the Carousel and Pinocchio's Village Haus. These new entrance gates are lovely - and provide a good foreground to the Beast's castle area; as well as a background to Cinderella's castle (although, technically the front-side of the castle is on the backside, and so forth, but we don't want to get into that). 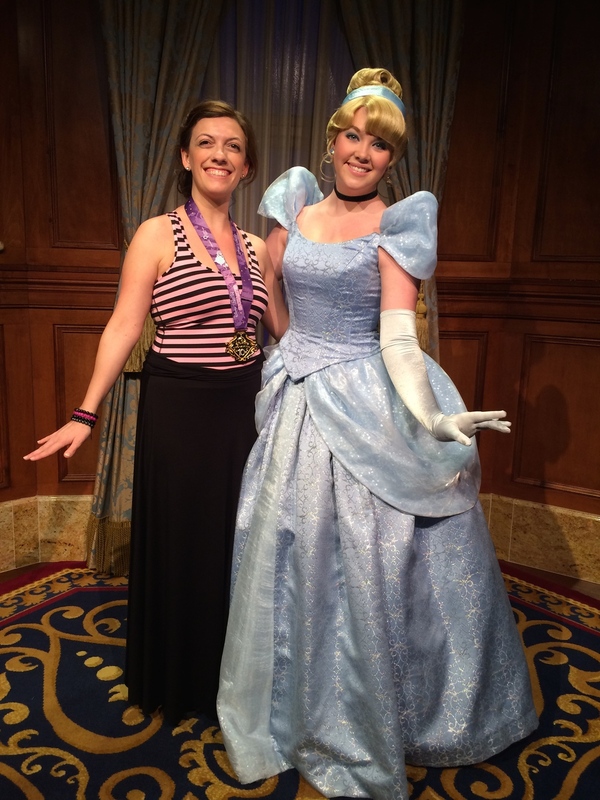 Speaking of Cinderella - I met up with her. Look at the bling around my neck. Maybe my gold medal rivals her glass slippers? 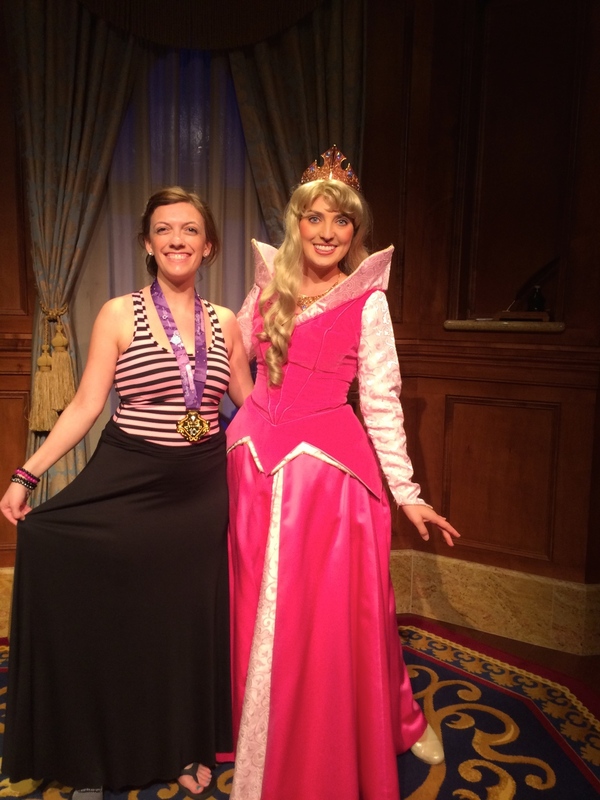 And the lovely Princess Aurora (Sleeping Beauty, Briar Rose....this lady has so many names). 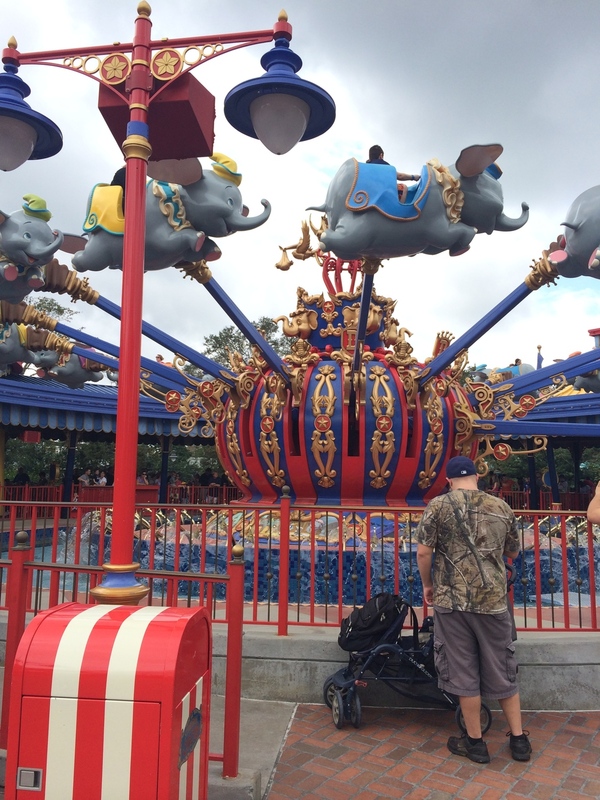 The new Dumbo area - with TWO Dumbo rides. I really like the theme they put on here with a more circus feel to it - not just in the name of the area, but the ride itself is designed aesthetically different. 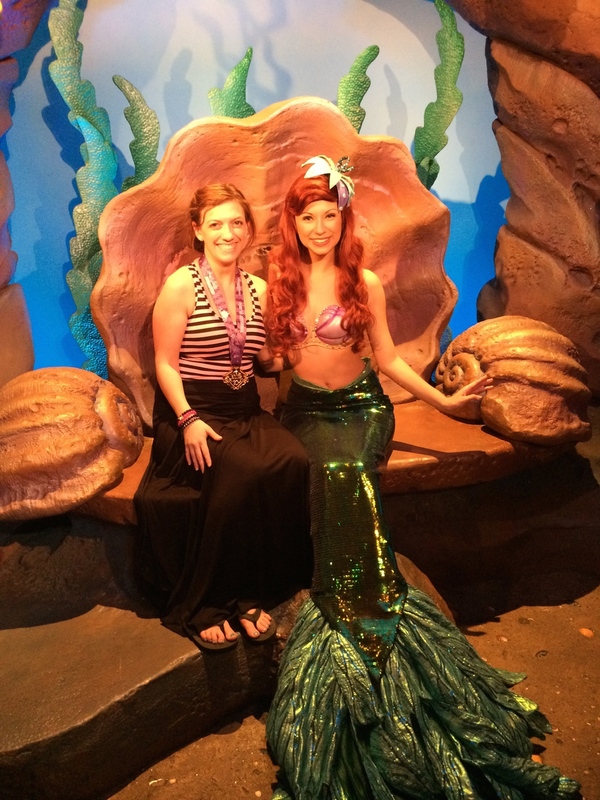 By this time I had met up with my friends, mind you, and we rode the new Little Mermaid ride. Which turned out to be exactly like the Mermaid ride at Disneyland. 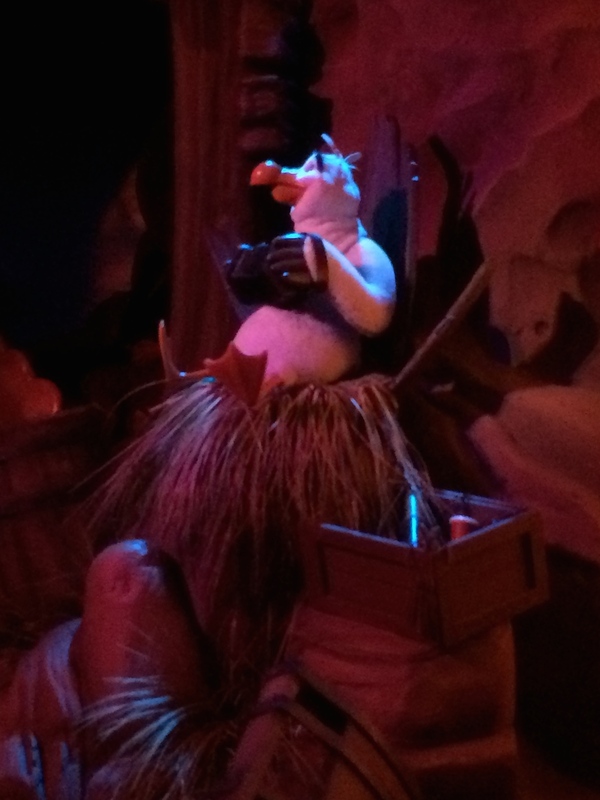 Oh well - here's a picture of Scuttle. 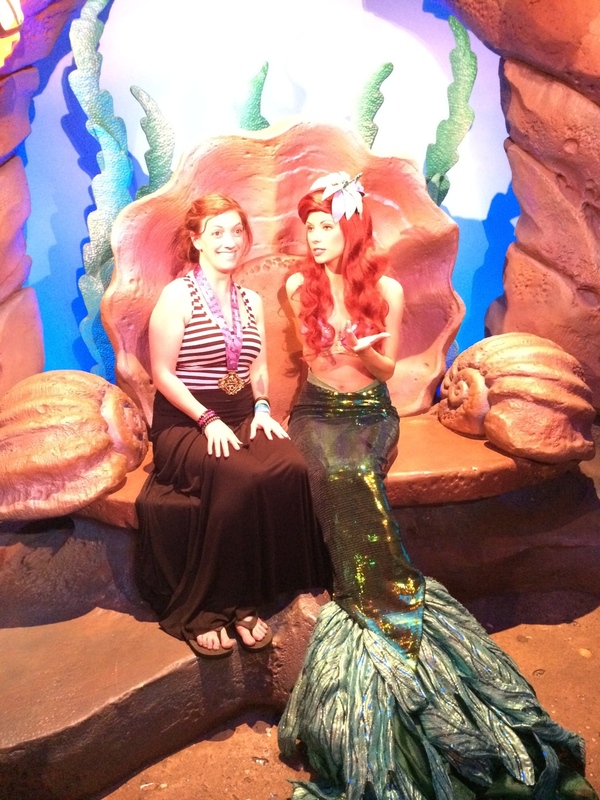 And then we met up with the Mermaid herself, Ariel, and she asked me all about my treasure. When we made our way to Tomorrowland, my friends took the opportunity with a short wait line at Buzz Lightyear's Space Ranger Spin. Now I do like that ride, but I'm horrible at gaining points on it, so it bugs me. And I opted to rest outside instead. 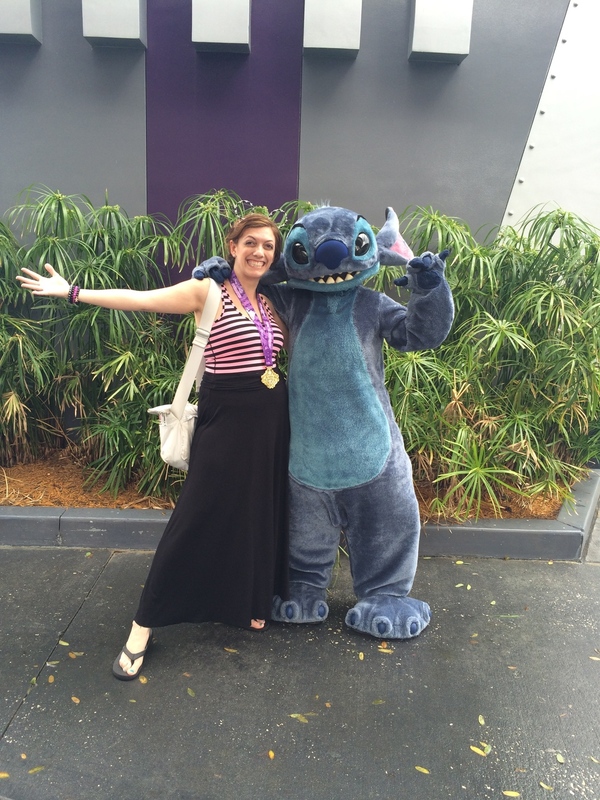 Because I did, I saw Stitch and was able to get a picture with him. 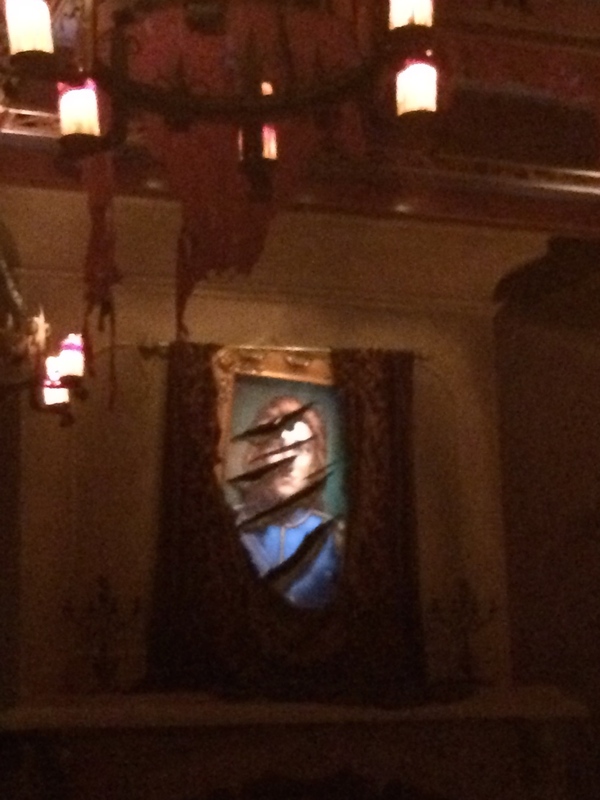 I had made reservations for us at Be Our Guest, and we headed that way. 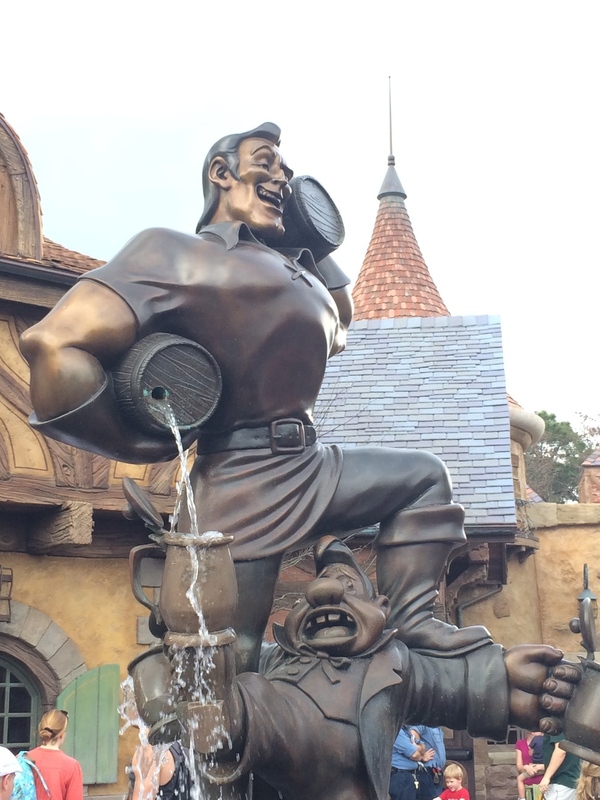 We ventured past Gaston's Tavern and this statue built in his honor (though, if you ask me, he probably had it built himself - demanded it in fact). What they've done with this area is fantastic. 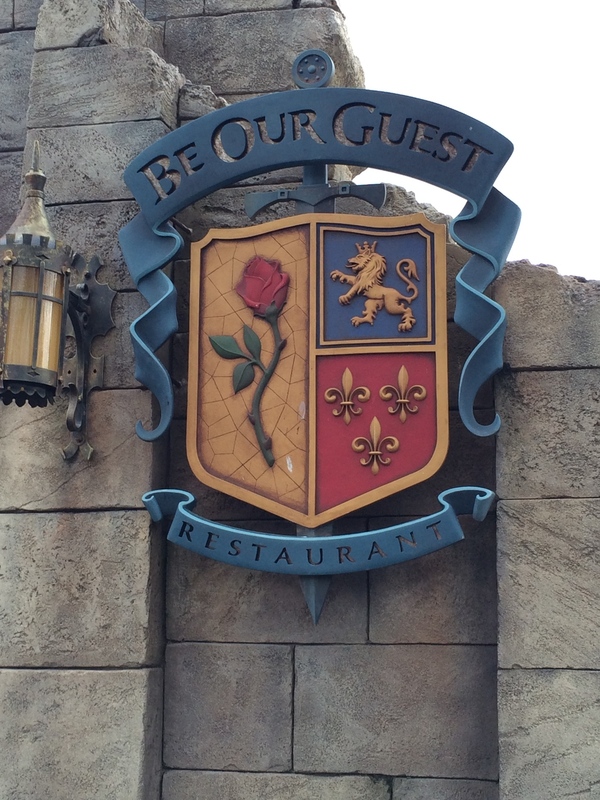 And to put another full service restaurant in Magic Kingdom is just what it needed to spread guests out. It's hard to get into this place, but I imagine it might die down once it becomes less "new." 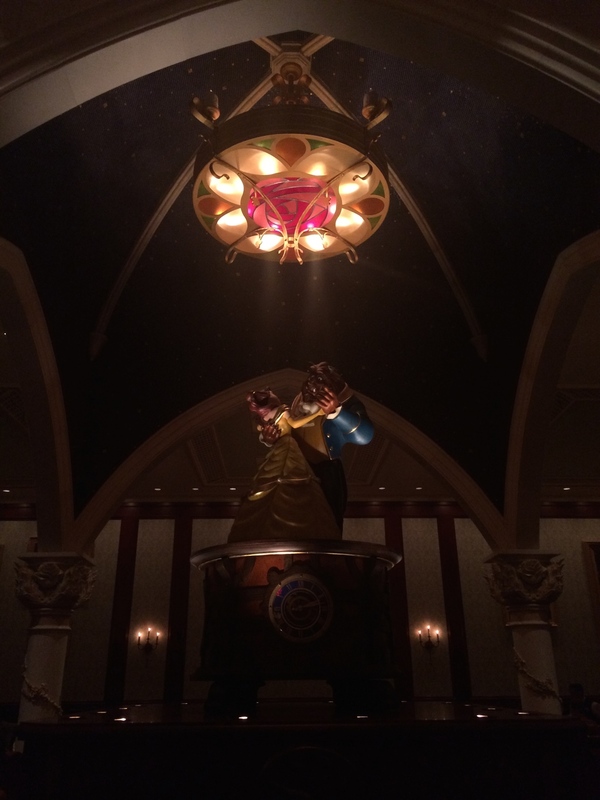 Though, Cinderella's Castle meals are still hard to get into, so maybe not. 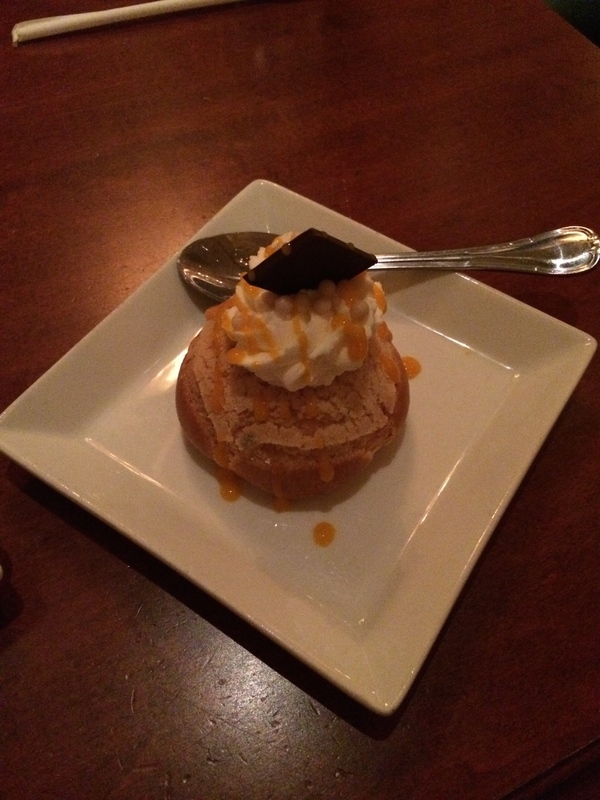 The interior of the restaurant is just as grand as the exterior. Three rooms each with their own theme. 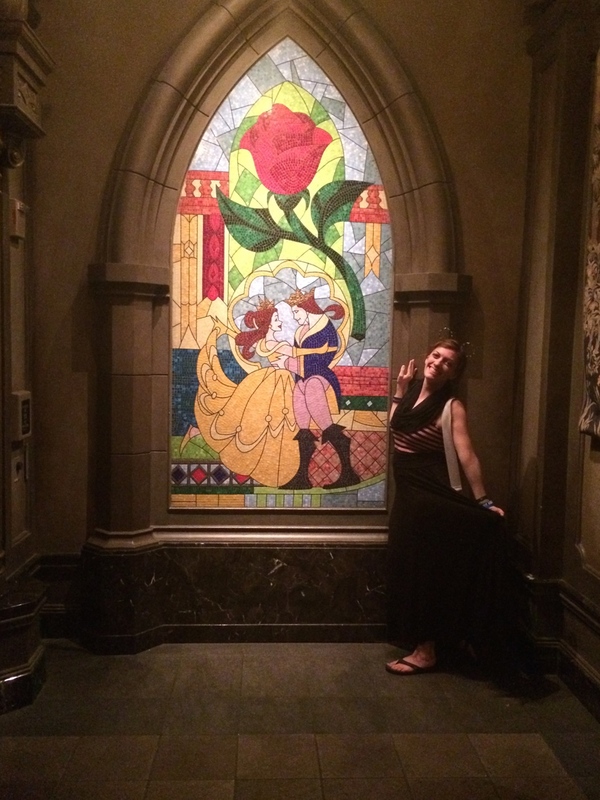 We were in the area where there were pictures of Belle & her friends on the walls, as well as a giant wood music box that Maurice made for the Belle & Beast. 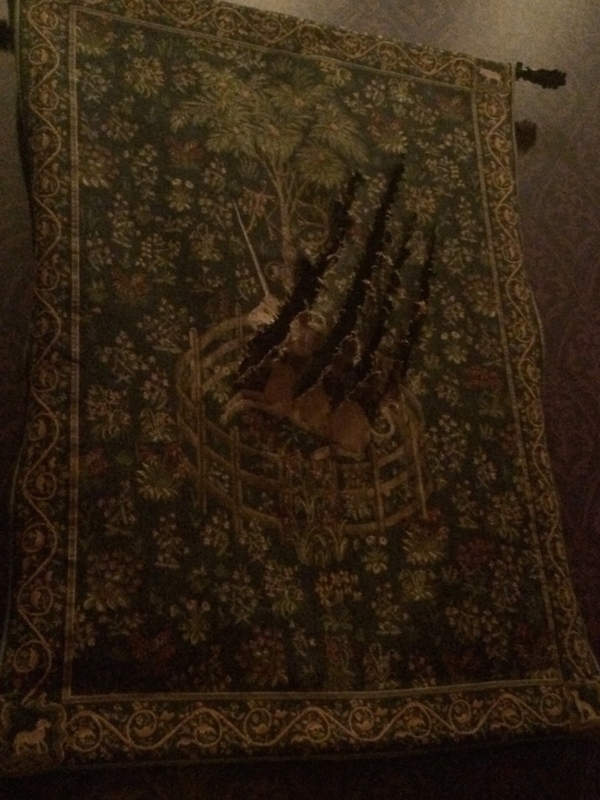 After dinner, we roamed around each room and took pictures (above); and made our way to the Beast's study for a picture with our host before we left. 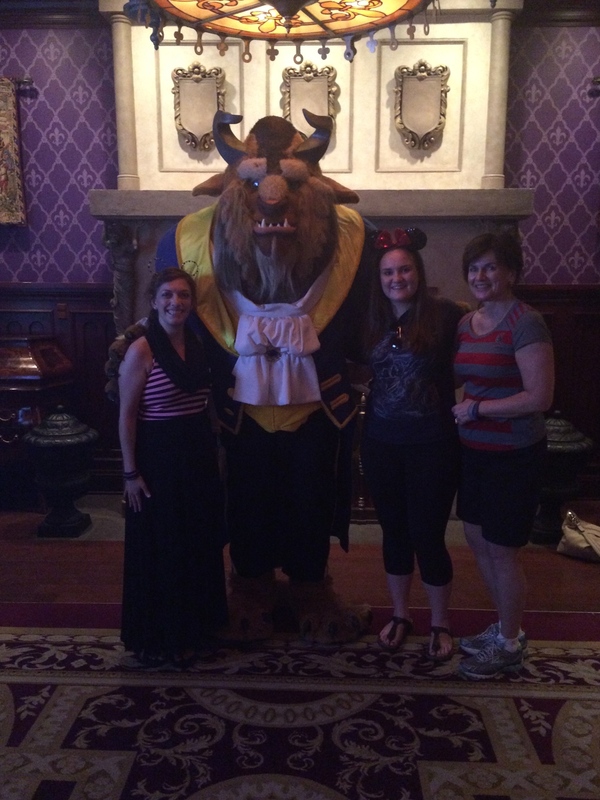 I told the Beast "Thanks for having us for dinner," then quickly corrected myself "Well, not having us for dinner, but allowing us to eat there." He gestured a chuckle at that one. I know, I'm a dork. Our dinner was early - about 6:30, and good thing, too. I had a half marathon the next morning to wake up at 3am for. 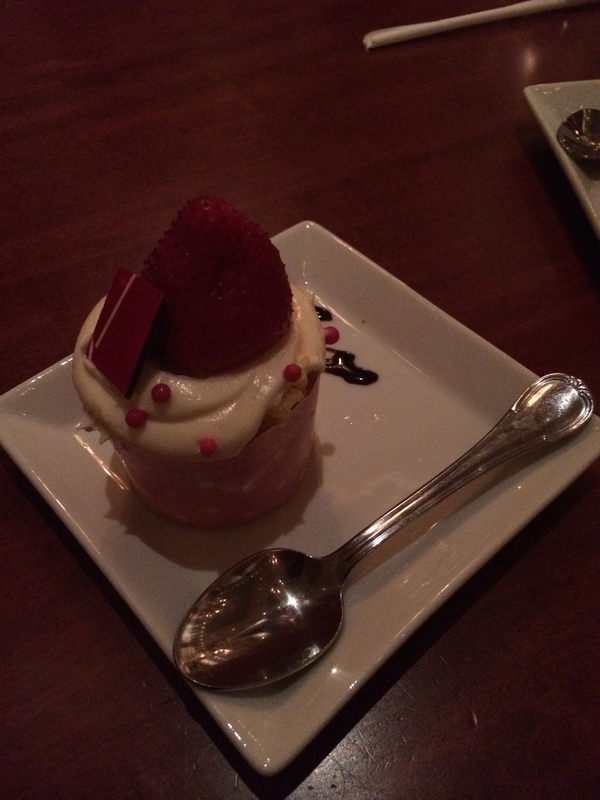 So, after dinner, it was back to the hotel for me.